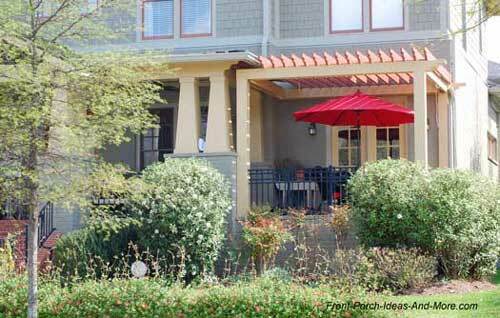 Our porch patio ideas include an innovative way to enlarge the size of your porch! 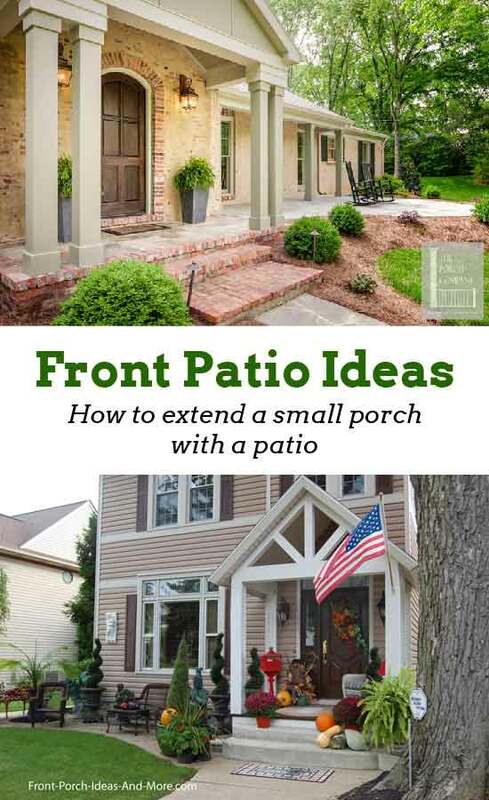 A porch extension (or patio) for small porches along with the right landscaping, outdoor furniture, and a few amenities adds real appeal and value! It gives additional outdoor living space and adds to the beauty and functionality of your home. A porch extension is easy to do and is relatively inexpensive as compared to many other similar construction projects. Because it does not need a roof nor extensive foundation, a patio area can be constructed from a variety of materials, like stone, brick, pavers, concrete, and more. Mary and I would love a spot like this to read the newspaper and have a cup of coffee. Wouldn't you? Our patio ideas make it possible. 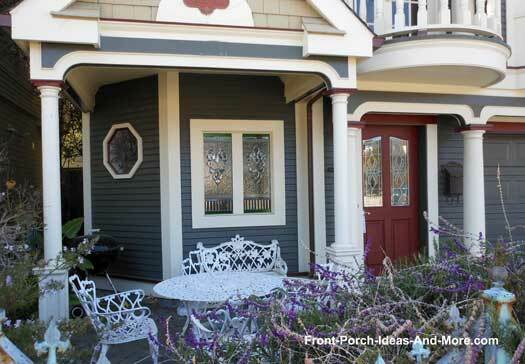 We've found lots of examples of some pretty neat and innovative patio porch examples as we've crossed the country. It is a perfect and very cost effective way to expand a small porch or portico to create the same comfort a large porch may offer. 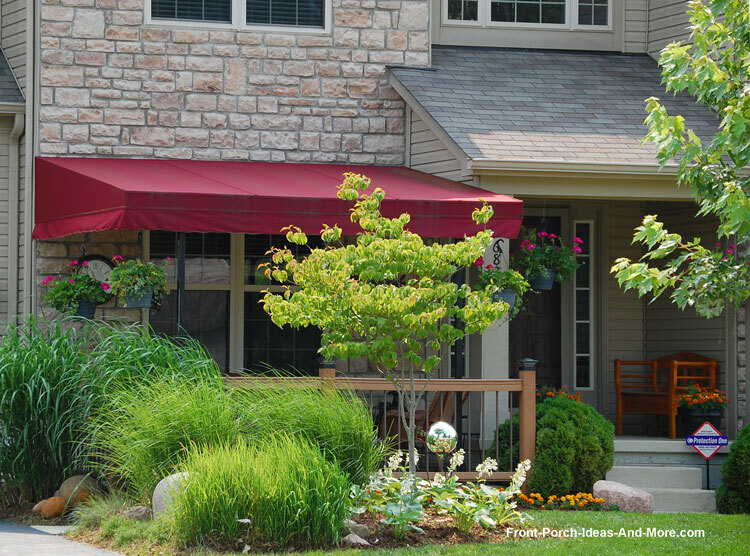 Many patios are covered with a pergola which is an easy way to create a bit of shade. You can also use it to support climbing flowering vines to produce even more shade and add color at the same time. We hope these examples will give you many patio ideas whether or not you are extending your porch. 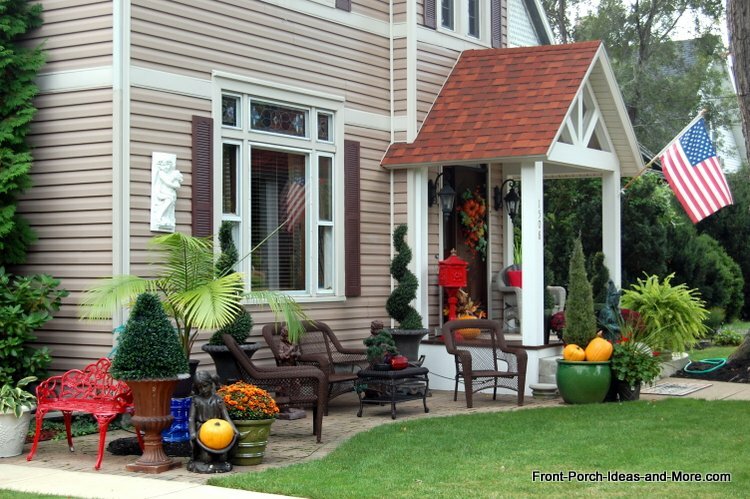 We found this patio idea in northern Ohio - all decked out for fall. We found this one interesting as the walkway doubles as an area upon which to expand their small porch for the season. 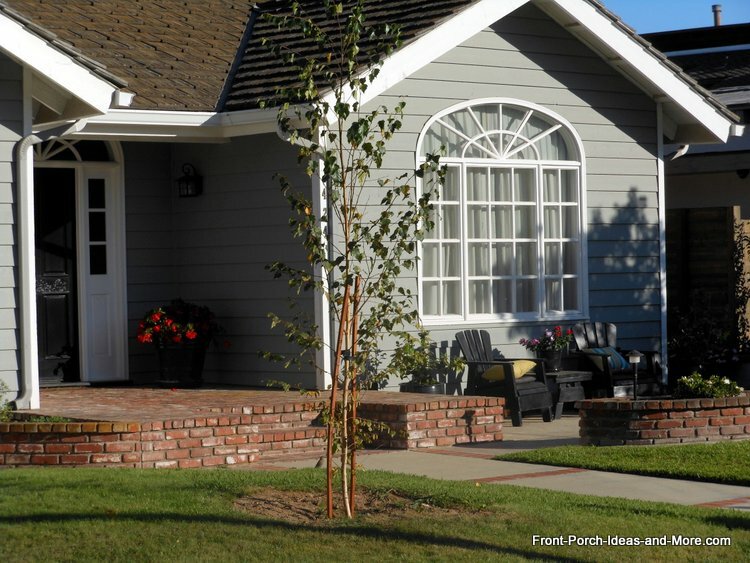 The brick planter creates a sense of harmony between the porch and patio making it a seamless transition with this patio in southern California. Note how the Adirondack chairs are painted to match the home; a real nice touch. Another appealing southern California patio porch extension. 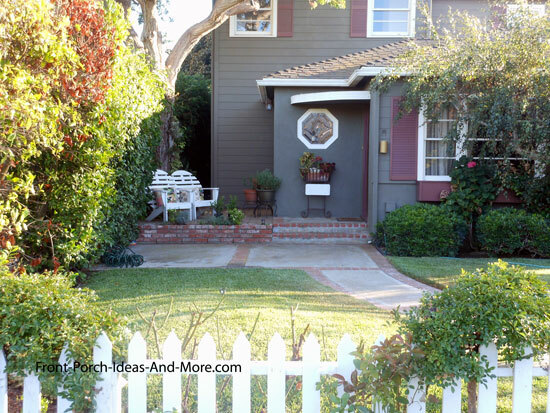 Such a nice way to enjoy your front yard and neighborhood. 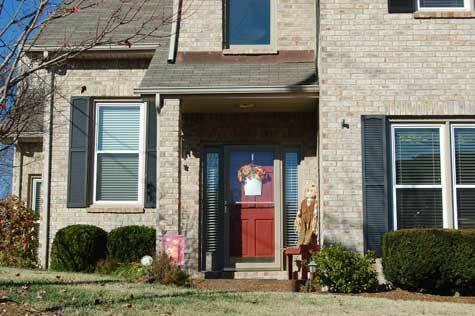 Extending your porch makes it not only more inviting but appear larger as well. 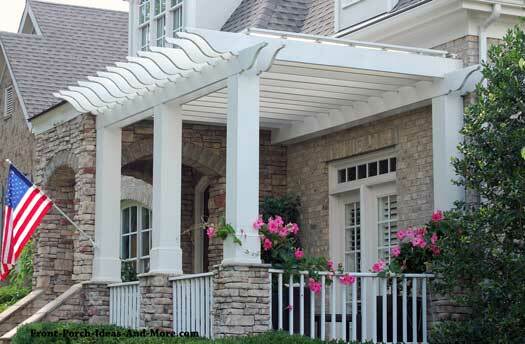 Also note the use of awnings and pergola-style roofs, other options that adds both comfort and appeal. By definition, a patio porch would be covered and that's great if you can do it. 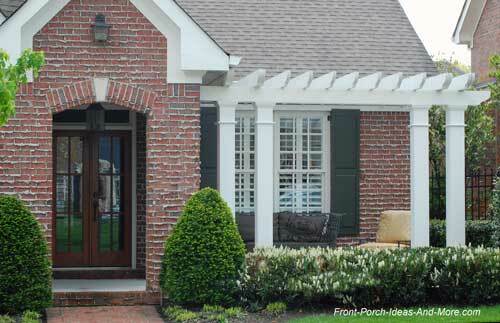 Whether covered or not, extending a small porch with a terrace can make your entrance more inviting. In the photo below, a pergola-type roof was added to create shade. 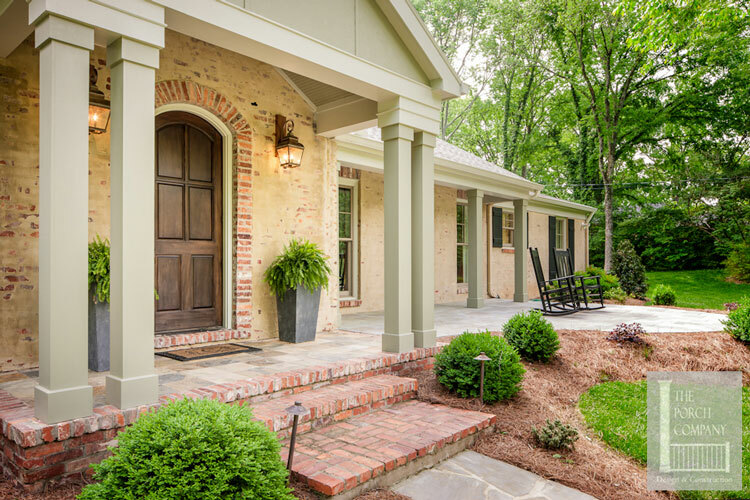 Try to envision this home without the extended porch - it makes a huge difference. A variation that can work well when adjacent space is not available, is to make a walkway leading to a patio area along side the front of the home. 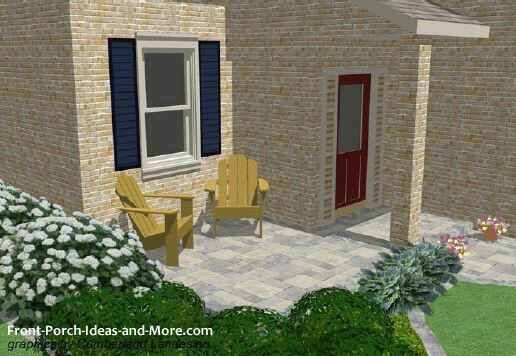 The photo below is illustrative of this patio idea. 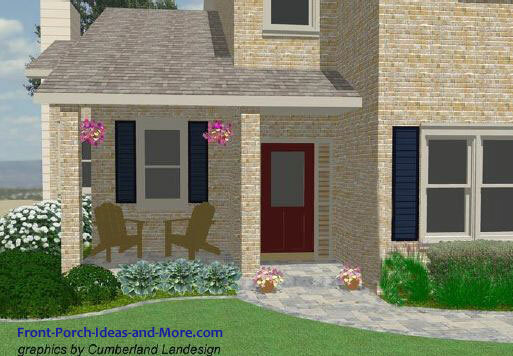 The shrubbery, once grown, will create a more private area - one among many creative patio ideas. This small porch was extended by expanding the area in front with a patio - where shrubbery probably existed before. They used benches and a planter as you can see from the pictures below to add appeal. These three porches are good examples of using available space to create additional outdoor areas. 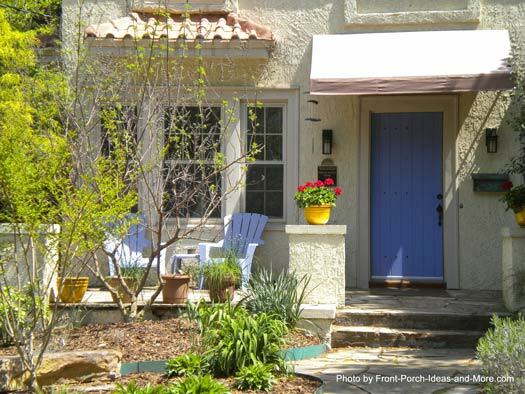 See patio ideas on two different style homes - a single story and two-story. You'll find walkway and landscaping ideas too. Have fun using our Porch Illustrator today. Often times it is difficult to envision your porch extension design. 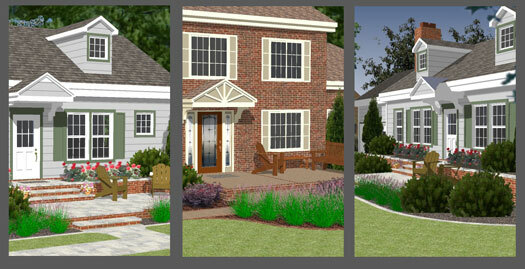 A 3-D rendering can solve that issue and give you a perspective you might not otherwise have. 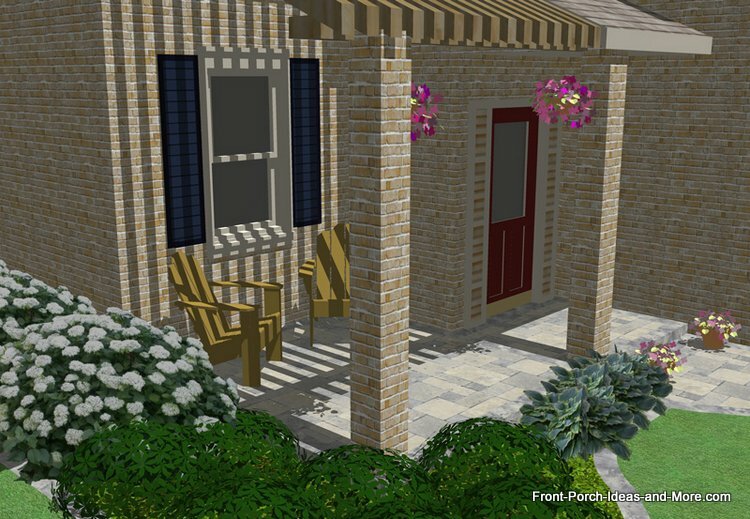 In this specific example, we show you how this very small porch can be extended with a patio, then a pergola-covered porch, and then a fully covered porch to match the home. Amazing difference to this home. Just imagine how you could expand your small porch into a much more enjoyable space for morning coffee or relaxing with a good book. Extensions on your back porch will give you a great area for grilling, additional seating, or just soaking up the sun. You can't go wrong adding additional outdoor living space! We know the following ideas will help you envision the "possibilities"! 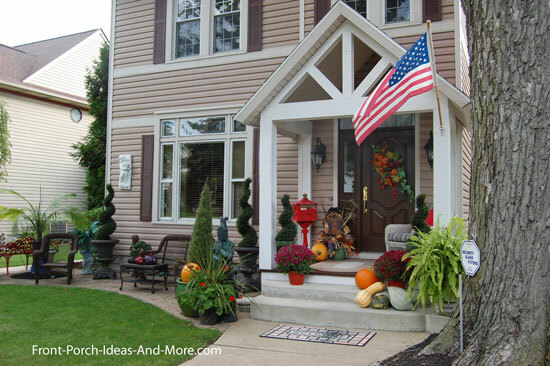 Here's a great trick - want to make your small porch or stoop appear larger? 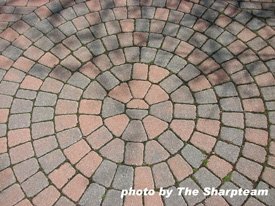 Resurface with thin tile, flagstone, or concrete pavers in a diagonal pattern. 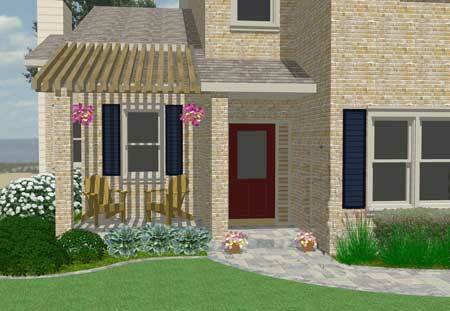 For privacy use vinyl lattice panels and cover with vines on the exterior and hang planter boxes on the other. Use interesting details like vases, unique plants, etc. If you have space on either side of your porch or even at the bottom of the stairs, extend this area with pavers or bricks to make a patio. This is a great DIY project. If you don't mind using some muscle power, have the time, and have a few tools, you can do this! And it's FUN. Take pictures along the way. Have a plan. Successful patio ideas start with a goal. Is it to improve curb appeal? Is it to create a functional space for rocking chairs and a swing? Is it to create a privacy area for reading a book or sharing a glass of wine? Analyze what you have available already. How much space do you have? Can you use any existing landscaping or will you have to purchase new plants, etc. Is your landing concrete, brick, or wood and will you continue with that material on your extension? Topography. What's your slope? Is it flat or do you have quite a bit of slope? No matter the current slope, your new construction must slope away from your house - a must to ensure you do not incur water drainage issues. If your space slopes significantly, you will need to include a retaining wall to create a fairly flat area (more on this later). Note any problem areas. 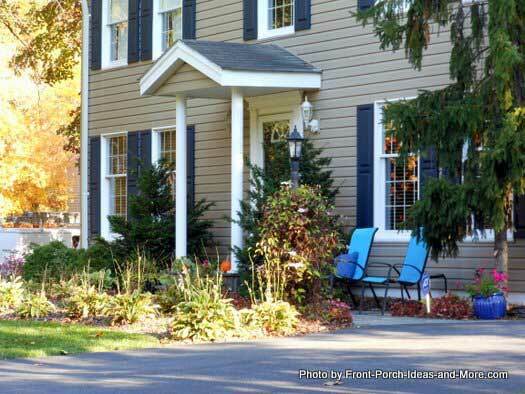 Do you have to move down spouts, large shrub, trees or re-route outdoor lighting? (Note: if down spouts are an issue, consider routing them under this new area you are building. Determine your budget. You can always do a lot with a little. Check out salvage yards and construction companies who often have leftover materials or discarded materials you may be able to have at little to no cost. Plan well - obtain your plants at the end of the season where you live. Unless you need immediate coverage consider seedlings or small plants - they will grow! They really will. If your budget allows you to upscale your project there are a myriad of stones, pavers, flagstones and other materials to fit any lifestyle. Since this is a patio, porch extension piers are not required but a good base is. Use cord, string, a garden hose to mark the perimeters of your patio extension. (Note: make these about 6 inches wider than the actual perimeter to give you room for edge boards. 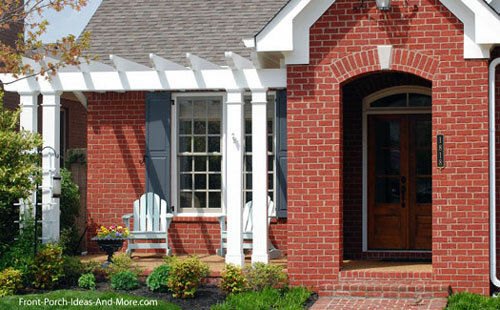 When calculating your area did you consider the size and shape of your pavers or bricks? For this example I'm using 4" x 8" bricks, about 2" thick. Brick pavers come in other sizes; but this size is easiest to work with. I try to make sure an even number fits nicely within the area; otherwise, I have to cut them. That's not difficult but it will add to costs and building time. Excavate the area by removing approximately 6 inches of dirt. To get the right slope I always excavate approximately 4-6 inches on the high side of the patio to 6-8 at the lower end. You will be filling this with stone dust (small gravel) and sand to make it level on top. The slope will help drain water away from your home! Build the frame. The frame will hold your pavers, flag stones, or bricks in place. There are several methods you can use depending on the look you want. I've used everything from treated lumber to edge bricks. When I use treated lumber I always ensure the top of the brick, stone, etc., are above the top of the boards. Plants/grass can then grow to cover the top of the boards. When I use bricks on edge I ensure I have adequate space for proper placement. Attach the frame boards to stakes at each corner of your excavated area. Depending on the span you made need to place stakes according to the length of your boards for support. Level the boards but remember to allow for slope. Plan for 1/4" slope per linear foot of patio to ensure proper drainage. Test it! Lay your outdoor patio tile (like bricks, pavers or interlocking tiles) within the boards to see how they will fit and adjust now accordingly! It will save you money and time later! Of course, follow the manufacturer instructions that come with your materials. If using a brick edge insert them end to end - one right next to the other). Using a rubber mallet, tap them into place. Lay your bricks/pavers within the boards to see how they will fit and adjust now accordingly! It will save you money and time later! Remove your bricks (except your edge) and fill with crushed stone (stone dust works great). Tamp it down. I leave about two inches at the top for sand. Before you fill the remainder with sand, lay down landscape fabric over the entire area to cut down on weeds. Fill the remaining area with sand. Make a screed from a 2x4. A screed is a board whose length is a few inches longer than distance of your framing. It is notched on each end to fit between the frame pieces. It's used to level the sand. Move it along to redistribute the sand to low-lying areas. Continue doing this until you have a level area on which to place the pavers. Starting from a corner, press the bricks into the sand - placing them as close together as you can. Use a rubber mallet to tamp the bricks down into the sand. You could do a simple basket weave pattern. Or you could do something much more exquisite like the picture shown here. Photo is courtesy of The Sharpteam. Use mason's twine to keep everything nice and even. When you are done with laying the bricks, then it's time to spread sand over them to fill in the crevices. This is actually kind of fun. Use a sturdy broom to push the sand into the cracks, sweeping back and forth until the sand fills the crevices. Work as much sand as you can in between the bricks. Using your garden hose, gently spray the remainder of the sand into the crevices. Do not spray too hard or you will wash the sand away - and you will have to backtrack and fill in the spots you washed out. Not so hard was it? 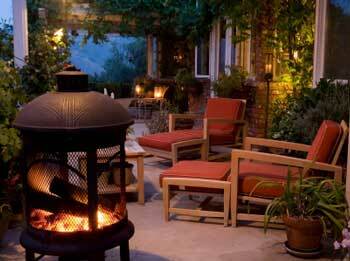 Remember, these are patio ideas general guidelines to show you that it is doable. Follow any manufacturer instructions that come with your materials. Ever build a deck or shed and wish you had added a few extra feet? You are not alone, we sure have. So when building a porch or patio, make sure you have enough space. Before starting, determine how much space you need. Compare that to a room or rooms in your home. How do they compare? Now, realize that outdoor furniture is typically larger than your chairs and tables inside. So go back and re-compute. Allow room for walking around and such. Then you have a better idea of how much space you need. Is there sufficient space available to accommodate the total space needed? If not, then reconsider the purpose for your porch. Perhaps all you need is a small conversation area or a space for your favorite plants. 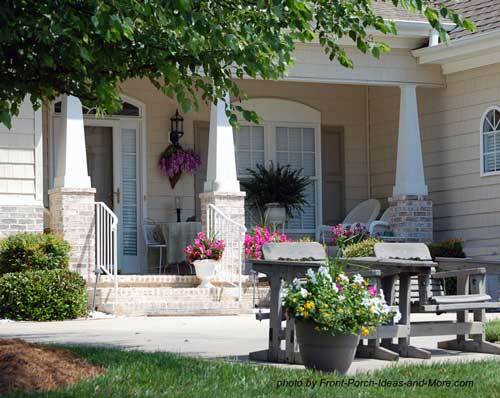 We hope you enjoyed our patio ideas - plan, build, and enjoy!